The Benicia Safe Routes to School Project included constructing safety improvements on routes to three Benicia schools as described below. These projects, which made it safer for children to travel to three Benicia schools, are included in the Solano Transportation Authority’s Countywide SR2S Plan Update. 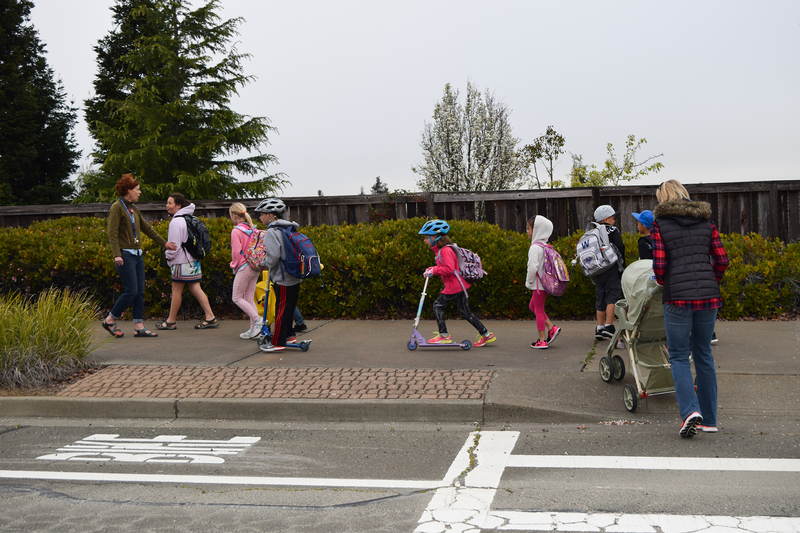 This Benicia Safe Routes to School Project (SR2S) followed the same environmental and design process as other federally funded projects, except with a more aggressive timeline to ensure the use of the funding within the time frame allotted. City staff was proactive in working with Caltrans on both the environmental and right-of-way clearance. The design portion of the project was split into three distinct tasks, each being done simultaneously by different agencies –City staff worked on one task and the remaining tasks were completed by separate design engineering firms. Completing this work simultaneously allowed for a faster delivery of the project. Construction of the SR2S project commenced on July 22, 2014. While the work was underway, the affected streets remained open to traffic at all times. The project was completed in November 2014 and was accepted as complete by the City Council of the City of Benicia on December 2, 2014. Benicia Middle School: Pedestrian activated flashing beacons were placed on both sides of Southampton Road at Turner Drive, in front of the Benicia Middle School, to assist students crossing this four lane arterial street. Before the project, there was only a crossing guard to stop four lanes of traffic for the students. The new flashing beacons provide a highly visible signal to vehicles that students are crossing the street. Matthew Turner Elementary School: Sidewalk bulbouts, landings, and high visibility crosswalks were placed on Dempsey Drive to enhance safety for school children crossing from Matthew Turner Elementary School to the Community Park parking lot and Kearney Drive area. Before the project, numerous school children queued up on the narrow 4 foot sidewalk, cross Dempsey Drive, and either take the stairs down into the parking lot or cross the parking lot entrance (where there was no crosswalk) to access the sidewalk to the south. The new landings and crosswalks provide a safe refuse and highly visible path of travel. Robert Semple Elementary School: Sidewalks were installed on El Bonito Way and Linda Vista to eliminate gaps in the pedestrian network leading to Robert Semple Elementary School. Before the project, the school children had to weave in and out of parked cars and walk in the street when raining to stay dry. The new sidewalks provide a dry, safe refuge to walk to school. The City’s SR2S Community Task Force, comprised of elected officials, City staff, and School District staff, met to update the SR2S plan. The Task Force also conducted walking audits at the three Benicia schools, observing drop off and pick up activities at identified locations of interest and documented concerns. As a result of the walk audits, several recommendations for improvements were made to improve the traffic circulation, congestion and walk ability for children. The recommendations were reviewed and prioritized by the Task Force. These projects were subsequently included in the Solano Transportation Authority’s Countywide SR2S Plan Update. The City’s SR2S project was approved by the Governing Board of the Benicia Unified School District on August 15, 2013. 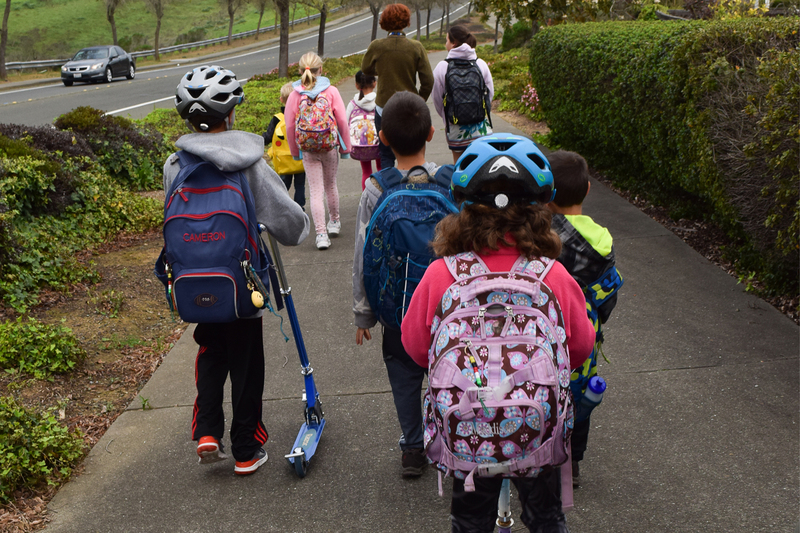 The City of Benicia’s Safe Routes to School Project (SR2S) was the first SR2S project to be completed in Solano County during this SR2S grant cycle. The project was completed in a time-efficient manner of 30 working days. 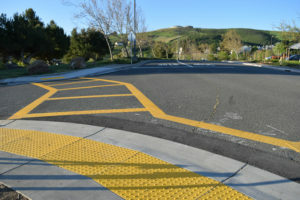 Benicia’s SR2S project substantially improved travel safety for students by adding sidewalks, flashing beacons, sidewalk bulbouts, landings and high visibility crosswalks. 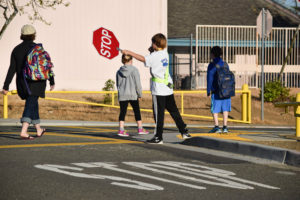 The City of Benicia staff wanted to construct improvements on school routes in an effort to make travel easier and safer for students to cross and street as well as to encourage students to walk to school.